Note: Arrays are also object by default. All array support the methods of the class Object. You can always obtain the size of an array using its length field. The classic for loop is shown in the slide. A counter is initialized and incremented for each step of the loop. When the condition statement evaluates to false (when i is no longer less than 9) , the loop exits. Here is the sample output for the program. The While loop performs a test and continues if the expression evaluates to true. The while loop, shown here, iterates through an array using a counter. 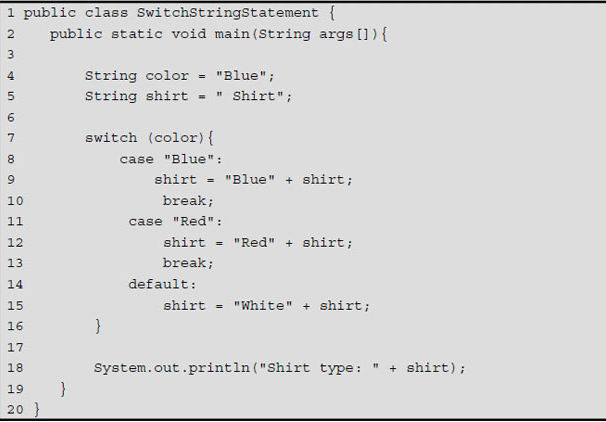 This example shows a switch statement in Java using a String. Prior to version 7 of Java , only enums and byte, short , char and int primitive data types could be used in a switch statement.